"If you're that interested in being a good father, why didn't you try harder before?" Film Movement has debuted an official US trailer for the latest film by acclaimed Japanese filmmaker Hirokazu Kore-eda, which first premiered at the Cannes, Toronto and London Film Festivals last year. Titled After the Storm, the familial drama is about an estranged father who attempts to reenter the life of his young son, with the moment to reconnect arriving with a typhoon. The cast includes Hiroshi Abe as Ryota, as well as Taiyo Yoshizawa, Kirin Kiki, Yoko Make, and Lily Frankie. One review from Cannes last year says that even fans of Kore-eda "might be taken aback by the supreme subtlety of his latest, achingly beautiful ode to the quiet complexities of family life." It looks like another honest, heartfelt Kore-eda film about being a parent. Dwelling on his past glory as a prize-winning author, Ryota (Hiroshi Abe) wastes the money he makes as a private detective on gambling and can barely pay child support. After the death of his father, his aging mother (Kirin Kiki) and beautiful ex-wife (Yoko Make) seem to be moving on with their lives. Renewing contact with his initially distrusting family, Ryota struggles to take back control of his existence and to find a lasting place in the life of his young son (Taiyo Yoshizawa) – until a stormy summer night offers them a chance to truly bond again. 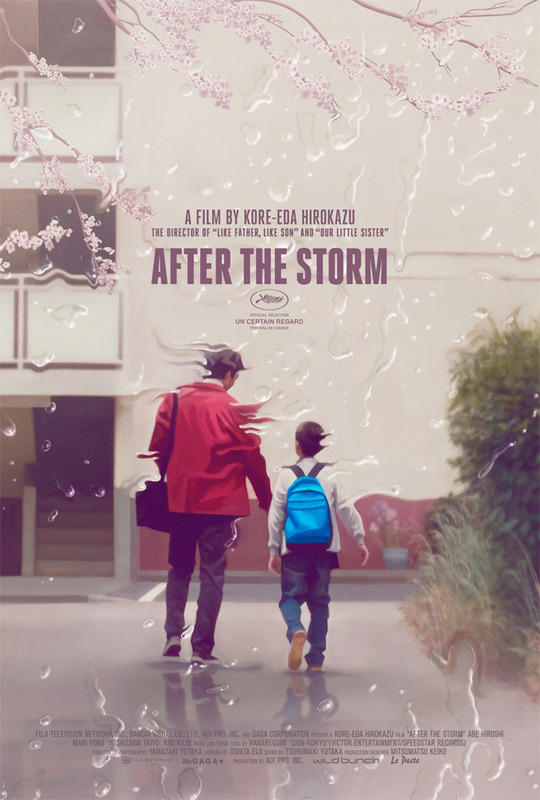 After the Storm is written & directed by acclaimed Japanese filmmaker Hirokazu Kore-eda, of Maborosi, Without Memory, After Life, Distance, Nobody Knows, Still Walking, Air Doll, Like Father Like Son, and Our Little Sister previously. This premiered at the Cannes and Toronto Film Festivals in 2016. Film Movement will release After the Storm in US theaters starting on March 17th. Looks very good. I will see it. Interesting. Some good quotes in there too. Interesting. Heartwarming and relevant, looks like it's worth a watch.